Roxy the dog is having a pretty exciting afternoon nap. Not only does she get to lay on the comfy couch, but her imagination seems to be conjuring up some pretty cool dreams! Roxy continually smacks her lips as she snoozes. It's probable that her unconscious mind has conjured up some dreamtime doggy treats for her to munch. 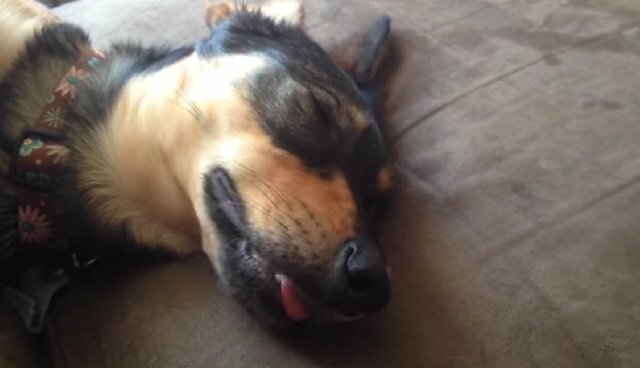 Why do dogs tend to have such expressive dreams? Because they have the same kind of sleep processes that we do! So when a dog has reached REM sleep, they have been known to whimper or try to run, in the same way that humans sleep-talk or sleep-walk.